Larga Vida XO Rum is probably one of Flaviar's most ambitious and longest running project to date. More than 3 years of hard work and effort have been put into sourcing, marrying, finishing, blending and branding. 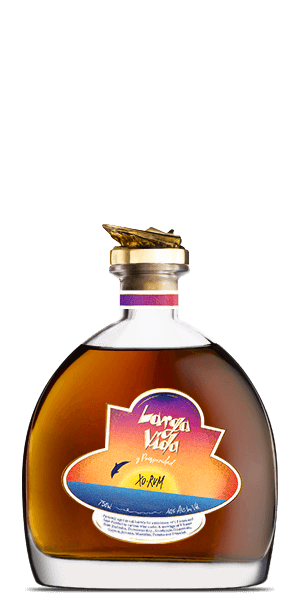 Sure, we could say Larga Vida is just another sourced Rum. But that wouldn’t be fair. It was done in a way where Flaviar had a total control over the whole process. Most of the juice was sourced directly from the makers, finished by us, later married and finished again to finally be blended into what Larga Vida is today. Larga Vida XO Rum is a concoction patiently aged in oak barrels for a minimum of 15 and up to 23 years and later finished in Ex-Merlot, Cabernet Sauvignon & Sherry casks. It’s a marriage of 9 distinct Rums from 9 specific Rum-making countries: Barbados, Dominican Republic, Guadalupe, Guatemala, Guyana, Jamaica, Mauritius, Panama and Trinidad. The result is more than the sum of its parts - more complex, balanced and rounded. Two Cherries on top? Some experienced Rum connoisseurs will be able to taste a proportion of Foursquare Rum that went into this blend. For more info visit: largavidarum.com. What does Larga Vida XO Rum 2018 Edition taste like? The Flavor Spiral™ shows the most common flavors that you'll taste in Larga Vida XO Rum 2018 Edition and gives you a chance to have a taste of it before actually tasting it. Love it. Very smooth taste. What a lovely Rum. Neat, with one or two cubes of ice or mixed, it is very good. It is smooth, with fruity and spicy notes as a very pleasant after taste. Incredibly smooth with great flavor. Just opened my bottle and wish I would have purchased two. Super smooth! Best rum I've ever had. I only bought two bottles. Big mistake. If you get the chance to buy this you MUST! Can we get another release ASAP?! I usually drink whisky but once in a while I need something a little sweeter with a warmer note. This did not disappoint. Smooth and warm. Almost as good as Bumbu. This is the best rum I've ever tasted. Period. All my friends agreed. I just wish I'd bought another bottle at the time. This rum made me "the man" even though I am a woman. My husband's friends literally thank me for purchasing this. They claim this is the first rum they've had that is worthy of drinking straight. Thanks!! Not a big fan of rum, others thought it was okay. Rum is one of my favorite spirits which is why I purchased this to try. It's a nice rum but lacks some of the sweeter flavor I anticipated based on the description. I tend to enjoy the obvious tastes such as a coconut rum, or other flavors. Def tastes good mixed with some Coke. Rather too rich in taste. But it might be wrong occasion or place (latitude) for tasting. This was really smooth rum -- I'm glad I got 2 bottles. Very smooth. Too alcoholic for my taste. Crowd favorite. Smooth and delicious. Loved it. One of the best runs I've tasted. Best rum we have tasted. Smooth and slightly sweet/tangy. We were blown we by how good it was! Straight up was nice but with the magic of ice a real nice sipping rum that i enjoyed relaxing in the sunshine with! I enjoyed this Larga Vida XO Rum very much. An ice cube or two and a wee dram of water smoothes it out nicely. I wouldn’t want to ruin the delicate honey and citrus flavor by mixing anything with this Rum. Super Smooth; not at all what I expected. The labeling and the top are a little unappealing but you don't buy a bottle for it's look. After the novelty wears off, you're left with a rum that does not need to be mixed but rather enjoyed like Bourbon...one or two ice cubes and you're off to the islands, kicking back in a chair, flicking your sandals off. This rum was just liked it said, smooth. I can not wait to get another bottle. Wasn't thrilled with the quality of the label or the topper, but I have to say, the rum is TASTY, and that's what it's all about. Nice blend of young and old, the blend might strip of of the deep notes of it but it tastes GREAT! This is certainly a quality smooth sipper. The level of sweetness is just right. The flavors in the spiral are all present and delicious, but not quite as profound or deep as some other premium rums I might rate as a 9 or 10 - so I couldn't give it higher than an 8. Wow! This is the perfect rum. Rich. Flavorful. Smooth. Enjoyed it neat, with a splash of water and on the rocks. Liked it best on the rocks. This is the best rum I've ever had. I wish I had purchased two. Very impressed with this. Drank a lot more than I had intended. My wife, who doesn't like to taste hard alcohol liked it as well. A strong rum flavor but no aftertaste or burning. Very smooth. Smooth, easy, delicious. I want more. First taste. Smooth and rich. No burning sensation. Still picking out all the flavors but I’m enjoying doing so. Not that much of a rum drinker but boy is this stuff good and smooth. Lucked out to get it. Thank you. I really enjoyed this Rum and definately want a couple more bottles for the collection. I really enjoyed it on the rocks as a nightcap. I really enjoyed this rum. I wish I had gotten two although I jokingly said the reason why I was chosen was because I only wanted one. Hopefully this comes back so everyone can enjoy this as much as us have in the lucky lot of winners. It is a great sipper just neat. I will try ice with it like some suggest. Great job on putting the blend of Rums together Flaviar. You have mastered an amazing rum. Hip Hip Hooray! Cheers! Very good for sipping. I found this to be very smooth, not quite like a diplomatico, but very good. Might be a little too sweet for some, but I found it very pleasant. I hope they release this again because two bottles is not enough. This is a bit Smokey, but it’s also freaking amazing. Wow! I am not a rum aficionado so I might not know how to compare to other rums. But this is one tasty bottle of liquor! A very nice after dinner drink. Very smooth. Sweet and buttery flavor. I may have to now try more rums but I really do love this one! Runs a little hot on the first few sips. After that all good. Nice notes of caramel and cinnamon. This is definitely a nice rum, with that nice sweet finish. I think my favorite thing is that has notes that remind me a lot of the taste of a new saxophone reed - warm and woodsy. Definitely should have gotten a second bottle. The complex and carmel flavor of this magical rum blend are almost hypnotic. You have to let it roll around on your tongue to fully understand the balance and complexity of this tantalizing rum. Glad I grabbed two bottles! It has a nice smooth start and a nice flavorful taste With a bit of the smoky Finish with a bite. The smoothest and most flavorful rum I’ve ever had. An enjoyable sipping rum. Taste the banana right off the bat then get a little sweetness and a hint of smoke at the very end. Definitely glad I decided to buy this. 9.5 Stars that I am likely over scoring slightly for the cool story and rarity of this bottling. First inhalation is bananas foster; sweet tropical fruit, vanilla, baking spices, brown sugar that is smoky and caramelized but not quite burned. Very sweet and fruit forward on the mid palate but the oak tannin and spice provides a long, balanced, and nuanced finish. The nose strikes of raisins and prunes, sweet and fruity but slightly earthy. The flavor of banana doesn't come through for me, but I definitely taste sherry, and it finishes with a woody, almost walnutty flavor, followed up with an exhale of smoke as you'd find in a peated Scotch. This is absolutely the rum I, as a bourbon and Scotch drinker, have been waiting for all my life. 10/10. This is a wonderful and complex rum. The flavors within the rum are harmonious and complement each other. Overall, I am absolutely satisfied with this rum. Very fruit-forward...it is a decent sip but could conflict in certain cocktail applications. I’m here for the whiskey but you can’t just drink the same stuff all the time. This run is great. It is in a really cool bottle with a speed boat In gold on the stopper. The rum is super smooth and tasty. Not too spicy but it is full of interesting flavors. Definitely sip able neat but I bet it tastes great I mixed drinks. No regrets on this one. I bet I impress my rum drinking friends if I see them before it is gone. Very nice. Great flavors and a smooth mouthfeel. Enough burn to cut the sweetness but not overpowering. Drinks like a cognac or whisky. Should have bought a second bottle. Smooth, flavorful, light sugars, not harshly overly sweet.